Kadence Schneider demonstrates the juggling skills she lerarned while participating in the the circus arts program. When it comes to being physically active, Noella Russell is no slouch. 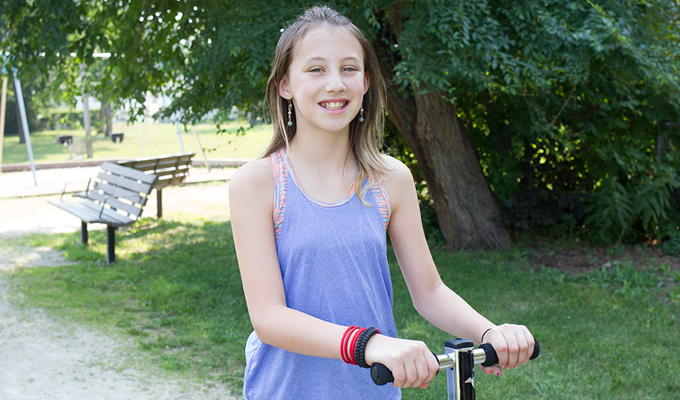 Skating, baseball, basketball, swimming - these are just a few of the activities she enjoys. Now, the 11-year-old can also add walking on stilts, juggling, and devil sticks to her repertoire. "That's a baton and two sticks that you use to hit the baton back and forth," explains the former Grade 5 student at Ecole Robert Browning, which is located in the St. James-Assiniboia School Division. "And it's not very easy." 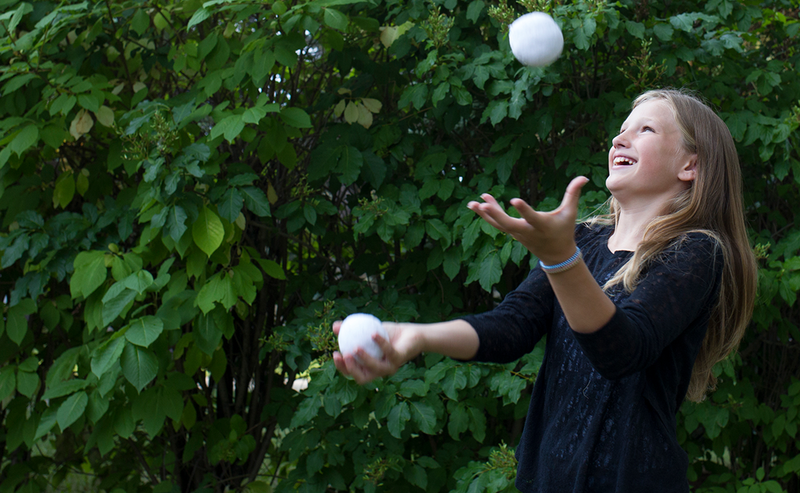 Her classmate Kadence Schneider can juggle, too. And, she can also ride a unicycle. "I can ride it for as long as I want," says the 11-year-old. Juggling is a little trickier. "I can do it sometimes," she says. For 10-year-old Brielle Maxwell, who attends Stevenson Britannia School in the same division, it's the trapeze. "I like it because I can get up very high, and I'm not afraid of heights," she says. Noella Russell says she enjoyed learning from peers at the circus arts program. If you're thinking these girls must have recently attended some kind of circus school, you're not far off the mark. They are among the dozens of Grades 4 and 5 students in the west Winnipeg school district who have participated in a two-year pilot program called the Circus Arts Education Initiative. The program was designed to teach kids a variety of circus arts, including how to walk on stilts, swing on a trapeze, and balance on a slackline (similar to a high wire), just to name a few. The goal, however, was not to train them for a job someday at Cirque du Soleil. Rather, it was to boost their "physical literacy," which will, in turn, help them to become more physically active. The initiative is the brainchild of Dean Kriellaars, an associate professor in the Department of Physical Therapy at the University of Manitoba, and Patrice Aubertin, Social Sciences and Humanities Research Council (SSHRC) Industrial Research Chair for Colleges in Circus Arts at the Ecole National de Cirque in Montreal. A leading expert in movement and physical activity among children and adults, Kriellaars says Canadian kids are not as active as they should be. Children between the ages of 5 and 17 should get about 60 minutes a day of moderate to vigorous exercise. Yet the most recent ParticipACTION report says that only 35 per cent of kids in this age group are meeting the mark. This does not augur well for the future health of the population. A recent study published by the World Health Organization (WHO) says that a lack of physical activity is partly responsible for rising rates of obesity, heart disease, Type 2 diabetes, musculoskeletal diseases like arthritis and osteoporosis, some forms of cancer, and neurodegenerative illnesses like Alzheimer's disease. Research also shows reduced physical activity may have negative effects on brain development in children and even contribute to higher rates of mental illness, depression and anxiety. Even more startling is that many of these health problems are showing up earlier in life. Diseases like Type 2 diabetes that decades ago were rare in children are increasingly commonplace. So what accounts for this lack of activity on the part of Canadian kids? Kriellaars says at least part of the problem can be attributed to the fact that kids aren't as physically literate as they used to be. As he explains, physical literacy is defined as having the confidence and skills to facilitate movement on land, in the water and through the air. "In the very simple sense, it just means the ability to move." The importance of physical literacy was underscored in the WHO report. It called on countries around the world to " . . . strengthen knowledge and teaching skills on the value of active play, physical education, adaptive physical activity, fundamental movement skills and physical literacy . . . "
That's not to say kids aren't getting some exercise. Many are engaged in organized activities like hockey or swimming. The issue is what they do in their free time. Forty years ago, children engaged in a wide range of activities - from riding bikes to playing hide-and-seek - that enabled them to gain the physical literacy needed to move competently and confidently in a wide variety of contexts. That's not as true today as it once was. "Children's development has fundamentally changed over the last 30 years in their use of the outdoors, their ability to be given free range," says Kriellaars. "Anybody age 40 and up can attest to being told [by their parents] to stay out until the street lights came on." Past generations of children had more freedom to make decisions, spot hazards, learn from their mistakes, and gain knowledge about movement. It used to be relatively common for kids to climb trees, enhancing their strength and improving their co-ordination and balance in the process. Now, parents worry that climbing a tree could lead to injury. Even when kids are active these days, it is often in a structured environment, playing Little League baseball or minor hockey. Skills like throwing and catching a ball are a kind of physical literacy, as are ice skating and stickhandling a puck. The problem is that if kids spend a lot of their time playing one specific sport, they might do little else that's physically active on their own time, thereby losing the opportunity to become literate in other physical skills. "Just being physically active isn't sufficient anymore because we've lost all of our physical literacy, and that manifests itself later on in life with growing sedentary behaviour and essentially unsafe abilities," Kriellaars adds. Indeed, kids who lack physical literacy when they are young may find that they are not as agile when they get older. By the time they enter their 50s or 60s, they may find themselves more sedentary and increasingly vulnerable to injuries due to falls. Kadence Schneider with her mom, Jennifer. "Twenty per cent of people my age and above who fracture their hip die every year," he says. "So as much as the goal is getting people physically active, it's more so about getting people to be competent and confident movers on different surfaces, like ice. And that starts at a young age." But if kids are not willing to be physically active on their own time, how do you help them become physically literate? The more Kriellaars pondered that question, the more he realized the answer was to infuse the concept into a formal physical educational context. And that's what led him to circus arts. "Circus finds something for everyone," he says. "It's inclusive by design, and that's the really big trick behind it." Children in the program can choose to develop competencies in a variety of activities that interest them, at their own pace. In doing these circus skills, the basic movement skills come along for the ride, says Kriellaars. "And they get very confident as a result," he says. 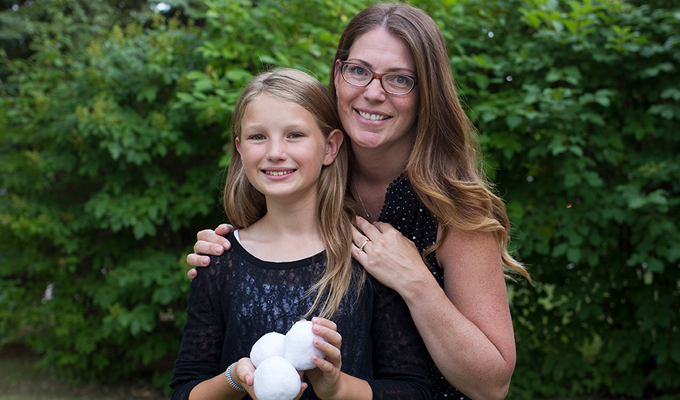 "Additionally, parents are just astounded at the joy and love their children have in doing this." Clayton Schneider agrees. He says his daughter, Kadence, often raved about the circus arts program in her physical education class after coming home from school. "Usually, they come off the bus and you ask them how their day was, and generally, the answer is 'Good,'" he says. "But she'd give us updates all the time - like about how many lengths of the gym she could go on the unicycle." Erica Maxwell saw an equal dose of enthusiasm from her daughter, Brielle. "It was all the kids talk about. Heck, all the parents talk about it," she says. "I feel it's really helped with their mental abilities and their confidence to keep trying something hard until they get it - and it's so absolutely exhilarating when they do get it." Teacher J.J. Ross also noticed that students were eager to participate in the pilot program. As the physical education and health co-ordinator for the St. James-Assiniboia School Division, he helped implement the program at the two schools, which were being studied alongside the regular phys-ed curriculum at two other division schools. Having worked with Kriellaars before on physical literacy research, Ross had no hesitation about participating in the study, which also included more than a dozen other schools in Manitoba, British Columbia and Alberta. "We were more than willing because we recognized that kids want to do this kind of stuff," Ross says. But educators also understood its value in building physical literacy skills in children. "You used to go play in the park daily and become physically literate without even knowing it," he says. "But now it's reached a point where we need to plan for it because it's not happening on its own, and this was just another tool - a great one." Brielle Maxwell says learning circus arts skills makes life more fun. To implement the program, the research team received funding for training and equipment through the Social Sciences and Humanities Research Council (SSHRC). Typically, the Canadian Institutes of Health Research provides funding for physical activity studies while SSHRC supports social science research. "But with our project, SSHRC saw that circus arts instruction in physical education fits into a social innovation model that also had health outcomes like increased physical activity, creativity, physical literacy and resiliency in children," Kriellaars says. To lead the circus arts lessons, Ross and two other phys-ed teachers - Bryan Vermeylen, from Robert Browning, and Curt McKinnon, from Stevenson-Britannia - attended circus training at the Ecole Nationale de Cirque program, which is located in Montreal across the street from the world-famous Cirque du Soleil. At first, Vermeylen was taken aback by the idea. "You think of clown college - I thought he [Ross] was joking, really." Yet both teachers immediately saw the potential when framed through the context of the acrobatics, athleticism and creativity of Cirque du Soleil. "Curt and I were both pretty pumped to try something different," Vermeylen says. "We've been teachers for 12 years, so this was an opportunity to freshen up the program. In terms of programming at the school, circus arts are definitely a way to increase participation, especially for kids that aren't drawn to the traditional programming - the typical sports you'd see in class." It's these kids who are often most at risk of not being physically active as they get older. Indeed, declining physical activity is a problem affecting most children as they enter adolescence, Kriellaars says, pointing to data showing kids generally become much less active after Grade 6. "Up until then, less than 50 per cent of kids meet the criteria for physical activity," he says. "After Grade 6, the number is between five and 10 per cent, so there's a huge, precipitous drop in physical activity levels in Canada and the United States." Girls are more likely to be at the low end of activity. Kriellaars says their lack of participation speaks to biases in society, which allow for certain activities to be favoured over others. Take floor hockey, for example. While it's true that more girls play ice hockey these days, it is still a sport dominated by boys. As a result, when a mixed class of children are playing floor hockey, a larger number of boys will likely have the skills that will enable them to play with confidence and competence. And those who don't - the majority of which are likely to be girls - may get less satisfaction and benefit from the activity. When this happens repeatedly in class, these students - literally standing on the sidelines, in some cases - start to see phys-ed as "not their thing," Kriellaars says. "What we found out is that, at a very young age, gender stereotypes are stopping females from developing their competence, confidence and happiness with physical activity compared with males, when it should be identical." The circus arts program can offer a solution to this issue because it is appealing to boys and girls by design. "You're drawing in the kids who don't normally enjoy phys-ed," Vermeylen says. "Then you're bringing in all the kids who are athletes who do gymnastics, cheerleading and dance outside of school." Even the ones who play sports like hockey and baseball find circus arts compelling. "They're so competitive, they really get into it, too." While the program was a hit during phys-ed, it was also popular during lunch and recess. Previous studies have demonstrated the effectiveness of circus arts programs. One study in Quebec, for example, found that students who took circus arts had better balance and greater ability in 15 of 18 basic movement skills that are part of the physical education curriculum, including jumping, catching, throwing, hopping, balancing, and even running. All of these, Kriellaars adds, are measures of physical literacy. But the larger study involving Winnipeg schools examined more subtle, yet equally important, outcomes. For example, the project revealed that children participating in the program were far more confident and had much higher levels of creativity than kids in a control group of schools. "We assessed movement creativity - and the children in circus schools had much higher levels of creativity at the end of the study than the control schools," says Kriellaars. "They were better able to create movement sequences to solve problems like, 'Show me how many ways you can go through a hoola hoop' - so likely better problem-solvers as well," he says. Kids participating in circus arts were also more active outside school, with children in the program participating in roughly five more activities than those taking standard physical education at school. And they also exhibited improved resiliency. Kriellaars says that's hardly surprising, given that falling from a unicycle and getting back up, over and over, until you can successfully ride it is a life lesson in itself. What's more, children learned on their own and from each other, leading to a newfound sense of responsibility and confidence. Indeed, learning from peers and vice-versa resonated with Noella Russell. "I liked that I could be with my friends and do the activities together," she says. "It's good to learn this way because you can see how others do something." Kriellaars says outcomes like higher confidence should not be underestimated in terms of importance because when children feel more confident about trying new activities, they will. "The interesting thing is that children who have better feelings about themselves are likely better able to deal with issues in their general life," he says. "That was also a major finding because now we're not just talking about physical health; we're talking about mental health." Given the program's success, the challenge today is to expand its reach to more grades and more schools. That's in the works, as the school division is training more phys-ed teachers to be able to offer circus arts and the program is expanding to other school districts. Certainly the students want more - and parents, too. "If it doesn't come back, there will be great sadness because every parent is excited to have their child try it," says Brielle's mom, Erica. "It was a big, big hit." "It was really fun because I got to learn how to do a lot of new things," she says. After all, before circus arts, Brielle would have never imagined swinging from a trapeze. Nor would she have predicted she would be performing her skills in front of a full gymnasium of parents, students, teachers and administrators as part of the circus arts program's culmination: a live performance showcasing their skills. "We performed in front of all the other kids at school . . . that's like a lot of kids," she says. And the audience was astounded. "Each time the children did something, the audience would ooh and aah," says Kadence's father, Clayton Schneider. "They expected the kids to be good, but they didn't expect them to be that good." Performances aside, circus arts offered an alternative to the typical physical education fare: volleyball, soccer, baseball and basketball. And you don't need to be a professor to see the value in that. As Brielle Maxwell says: "If you don't know how to do a cartwheel or hand stand, life just wouldn't be as much fun." Physical literacy can play an important role in helping young people become more active, according to Sport for Life, a Canadian organization that promotes physical activity. "Physical activity is a lot more fun when we're physically literate" says the group's website, www.sportforlife.ca. "If we want children to be active for life, ideally they will need to develop physical literacy at a young age." Motivation and Confidence (Affective): Motivation and confidence refers to an individual's enthusiasm for, enjoyment of, and self-assurance in adopting physical activity as an integral part of life. Physical Competence (Physical): Physical competence refers to an individual's ability to develop movement skills and patterns, and the capacity to experience a variety of movement intensities and durations. Enhanced physical competence enables an individual to participate in a wide range of physical activities and settings. Engagement in Physical Activities for Life (Behavioural): Engagement in physical activities for life refers to an individual taking personal responsibility for physical literacy by freely choosing to be active on a regular basis. This involves prioritizing and sustaining involvement in a range of meaningful and personally challenging activities, as an integral part of one's lifestyle. The World Health Organization is calling on nations around the world to incorporate physical literacy within their educational systems as a way of tackling sedentary behaviour among kids. In a recent report, the WHO noted that as many as three in four adolescents around the world do not currently meet the global recommendations for physical activity set by the organization. As a result, the WHO is encouraging nations to ensure educators are trained in the role physical literacy can play in helping kids become more active. Specifically, the report calls on nations around the world to partner with the education sector to help educators strengthen their "knowledge and teaching skills on the value of active play, physical education, adaptive physical activity, fundamental movement skills and physical literacy, and on how to include people with disabilities and the least active." 1. Create active societies: To do this, stakeholders must build societies that enhance people's knowledge and understanding of the multiple benefits of physical activity based on their ability and age. This includes national and localized campaigns to promote awareness and appreciation for the economic, social and environmental co-benefits of physical activity, especially walking, cycling and other forms of active transport. As well, initiatives should allow for mass participation, be easy to access, affordable - if not free - and culturally appropriate. Other programing would improve knowledge regarding these benefits among professionals working in health care, urban planning, education, tourism, transport and recreation. 2. Create active environments: Build new and conserve existing places for people to be active that are accessible and equitable, regardless of ability. This includes strengthening urban transport plans with bike routes and walking paths, and building communities that encourage outdoor interaction. Policymakers should put in place plans to improve existing green space and recreational amenities, ensuring they are accessible to people of diverse backgrounds including age, ethnicity, income and ability. As well, existing and future public amenities, schools, sports and health-care facilities should encourage users to be as physically active in and around the buildings as possible. 3. Create active people: Governments should fund and support more physical education programs while ensuring recreational and sports activities create more positive experiences and opportunities for a diverse number of people. These initiatives should be considered part of an effort to provide universal health-care access, by encouraging increased physical activity and by reducing sedentary behaviour with the help and guidance of trained health, community and social care providers. As well, programs must be aimed at children of all ages and adults, including seniors. 4. Create active systems: At the policy level, governments, industry and post-secondary institutions must craft frameworks to facilitate the other pillars. Using enhanced data systems, stakeholders can leverage statistical information to better target and track at-risk populations. Additionally, all programs and policies should involve partnerships across regions and nations, as well as involving the public and private sectors. Underpinning all this, the report notes, is the necessary funding to secure implementation and success. To read the entire report, visit: Global Action Plan for Physical Activity: 2018-2020 - More Active People for a Healthier World.